If you have a Cricut and you’re interested in making stencils, then these tutorials will be very useful. 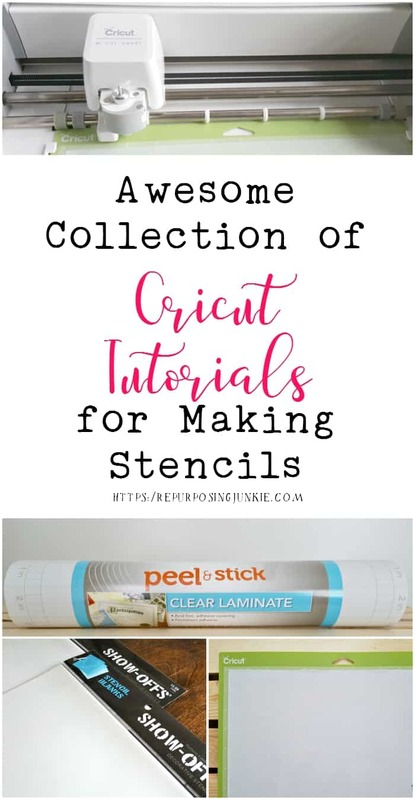 I put together an Awesome Collection of Cricut Tutorials on Making Stencils, and I hope you find them helpful in your stencil making endeavors. Just click on the link above the picture or the picture and it will take you to that specific Cricut Tutorial. This is a step by step guide on making JPEG Files into Cut Files in Cricut Design Space. If you’re making a stencil using a JPEG file then this walks you through the process of turning the JPEG file into a cut file in Cricut Design Space. This tutorial gives a run down on how to make stencils using the SHOW-OFFS Stencil Blanks that are sold at Hobby Lobby and how to make them in Cricut Design Space. This is a bit of a lengthy tutorial but a thorough walk through on making extra large stencils in Cricut Design Space using 2 different methods. If you’ve ever made a stencil and wondered why some of the middles of the letters fall out then this is definitely a must-check out tutorial. This tutorial is for making adhesive stencils using the peel and stick clear laminate. This is a step by step guide on making stencils for those beautiful wood signs. Not only does this tutorial give a step by step on the stencil making process but also a how-to on stenciling the signs. This tutorial is a very detailed step by step on creating your own stencils using the photo editing software, Be Funky. Then stencil designs can then be cut in Cricut Design Space. This is a tutorial on making extra large mandala stencils in Cricut Design Space. Here’s a selection of stencil fonts that are great for making stencils on the Cricut. This is a post that has a Supply List for Making Stencils using a Cricut. Again, I hope you find these stencil making tutorials helpful! The Cricut looks like an incredible machine! I’m saving your instructions in case I ever get one! It really is pretty handy. If you do get one, I’d be glad to help if I can. I have a first generation Cricut that I bought a few years ago. I really want to get the newest and best one for make stencils for my painting party business. What do you recommend? If I’m more interested in making jewelry which Cricut would you recommend or does it matter, thank you! Hi Terri, I’ve actually never made jewelry using the Cricut so I couldn’t really tell you which one would be the best for that, sorry. I will say that I have a Cricut Explore One and it works great for what I need to cut, however, if I were to update my machine it would be to a Cricut Explore Air 2 or a Cricut Maker.